As 2018 draws to a close, interior designers are already starting to look toward new bathroom design trends in 2019. And a lot of great new ideas are popping up! We love to incorporate new trends in our classic designs, giving you an updated, yet timeless look. If your bathroom could use a facelift, you’ll want to check out these latest style ideas. One of the newest trends we’re seeing is free-standing soaker tubs. And we can understand why – they make the bathroom as a whole feel airier and more streamlined while still offering a cozy bath nook. Win-win! Our transitional master bath remodel is a great example of all the parts of the bathroom working together, with the tub as a strong focal element. These days, shower doors don’t have to be doors at all! You can have a few shower door panels and leave the rest of the edge open, creating a roomy and inviting space. And using heavy glass doors (instead of aluminum framed doors) creates a streamlined look – and one that’s easier to clean too. A few touches of sparkle can really class a bathroom up. And really, why should the dining room have all the fun? This master bathroom remodel with a bit of bling showcases mirror-mounted sconce lighting and a unique, modern chandelier above the freestanding slipper tub. There are many lighting options to choose from, and this is a place where a small thoughtful choice can have a big creative impact. The popular rustic chic trend is just as trendy in the bathroom. Cabinets with a finish that is worn to just the right level make a statement, and vintage or upcycled fixtures help complete the look. Wainscoting is another great way to bring in that farmhouse feel. 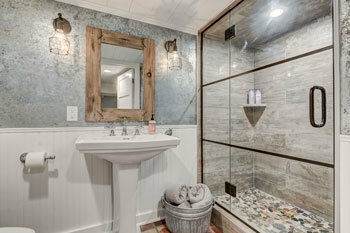 Our “Rustic Farmhouse Bath Remodel” is a stellar example of all these elements combined. We are seeing more and more unique metals work their way into contemporary bathroom designs, making style statements of urban industrial to warm Venetian to simple vintage. From elements such as the caged light pendants, steel pipe toilet paper holder and towel hook, and galvanized sheet metal on the walls of this basement bathroom remodel to a full-on copper-inspired master bath (complete with double bowl undermount hammered copper sinks, a copper-finish slipper tub, and Venetian bronze fixtures), bringing metal into the mix is definitely on-trend. 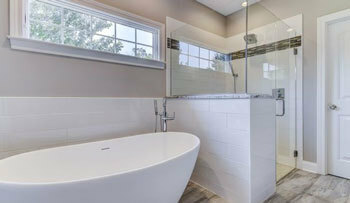 More and more homeowners are remodeling their bathrooms with their future in mind. For example, this handicap accessible master bath balances function and form so that it is attractive now and will continue to be usable as the homeowners grow with their home. Is your bathroom in need of a little remodeling? Now is the time! You can incorporate some of these contemporary bathroom trends while still retaining certain classic features, resulting in a new bathroom that will stand the test of time. Our experienced designers can help blend your favorite ideas from the list above into a cohesive bathroom design that you’ll love for years to come. And our team of professional contractors can help turn those designs into reality. 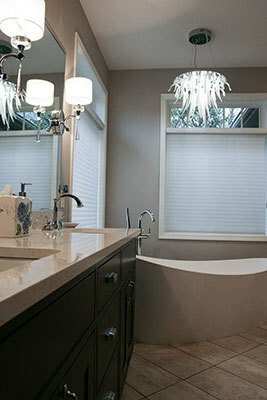 Give us a call today or stop by our showroom to see how we can bring a contemporary design to your bathroom.